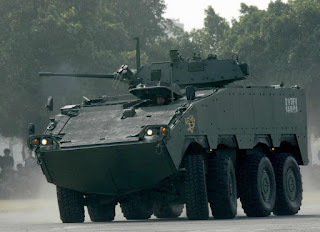 TAIPEI, -- The Armaments Bureau always planned to develop an infantry fighting vehicle (IFV) version of the Clouded Leopard, known as the TIFV, with more destructive firepower. After encountering several technical obstacles, the Republic of China Army (ROCA) decided to install a US-made Mk44 Bushmaster II 30mm chain gun from ATK. Under this programme called the Centrino Project, some 284 TIFVs with Bushmaster cannons will be produced from 2017-21. These will be assigned to ROCA mechanised infantry brigades. Taiwan began mass production of the Clouded Leopard in 2007. The armoured personnel carrier (APC) variant is equipped with an indigenous TS96 automatic weapon system housing a T91 40mm grenade launcher and T74 7.62mm machine gun. The ROCA was concerned the Clouded Leopard’s existing weapons could not penetrate Chinese armoured vehicles of the same classification soon after CM32 command and CM33 APC versions became operational. The Army Command thus urged the Armaments Bureau to develop a better solution, though the programme was shut down in 2010 after it failed to meet requirements. After several years passed, the National Chung-Shan Institute of Science and Technology (NCSIST) successfully mounted a Bushmaster II 30mm gun mounted in a turret, conducted tests and proved it was able to meet ROCA needs. Besides the army, the ROC Marines Corp could purchase this chain gun variant but it has not decided this yet. Currently, the ROC Military Police operates an APC variant, a unique type allocated to evacuate the top leaders of the government to the Heng Shan Command Centre on the outskirts of Taipei in the event of an emergency situation. The Republic of China Armed Forces CM-32 Yunpao ("Clouded Leopard") is an eight-wheeled, modular armored vehicle.